WBO welterweight champion Jeff Horn (18-0-1, 12 KOs) is looking to cash in big for his mandatory defense against Terence ‘Bud’ Crawford (32-0, 23 KOs) in 2018. Horn, 29, won’t be agreeing to take the fight against Crawford for $1 million. Horn is looking to get at least 4 times that amount at $4 million at the very least if not $5 million. Horn looked good in winning his voluntary defense against Gary Corcoran last week to clear the path for the Crawford fight. That doesn’t mean that the Horn-Crawford fight will happen next. 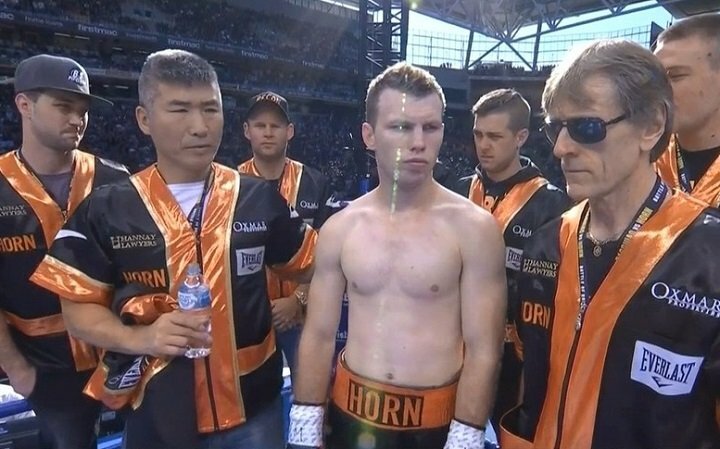 Horn has the option of facing Anthony Mundine for a $2 million payday. If the choice comes down to Horn fighting Crawford for $1 million and Mundine for $2 million, it’s pretty obvious which direction he’ll go in. Top Rank needs Crawford to become a star for them. Horn is standing in the way of Crawford becoming a star that he needs to be to replace Manny Pacquiao as a PPV guy. Horn vs. Crawford would be shown on ESPN and not on pay-per-view in the states unfortunately. Crawford isn’t a PPV level fighter as of yet in America, and that’s a problem when it comes to generating big money. Crawford brings a lot of risk to Horn without the reward of big money that you’d like to see for someone hyped as much as he is. If Horn is going to risk his WBO title, he would like to get paid for it. For a lot of boxing fans, the Horn-Crawford fight is viewed as Crawford’s coming out party for the welterweight division. The fight is seen as a mismatch in favor of Crawford. Horn is the guy standing in Crawford’s way as the opponent. Given what Horn is going up against, it’s smart for him and his promoter Lonergan to be looking to get the biggest payday possible for that fight. If they can make more money fighting the 42-year-old Australian Mundine or one of the other welterweight champions before they face Crawford, then it makes sense for them to go in that direction.